With a Long March-3B rocket putting a new communication satellite into orbit on Sunday, China's Long March carrier rocket series completed 300 launches, having sent more than 500 spacecraft into space since 1970. "This is a milestone for China's space industry development," said Wu Yansheng, board chairman of the China Aerospace Science and Technology Corporation (CASC). "Intensive launches have become normal in China, indicating the rapid development of the space industry, the progress of science and technology and the enhancement of national strength," said Shang Zhi, director of the Space Department of the CASC. China joined the space club on April 24, 1970, when the Long March-1 carrier rocket launched the country's first satellite, Dongfanghong-1, into orbit. At that time, the carrying capacity of the Long March rocket was only 300 kg. On November 3, 2016, China's current largest carrier rocket, the Long March-5, made its maiden flight, with its carrying capacity reaching 25 tonnes for low-Earth orbit and 14 tonnes for geosynchronous orbit. A total of 17 types of Long March carrier rockets have been developed and put into use since 1970, ensuring the implementation of a series of key space projects including manned space program, lunar exploration, BeiDou Navigation Satellite System (BDS) and the Gaofen Earth observation project. In addition, the Long March carrier rockets also launched a large number of meteorological satellites, resource satellites and oceanographic satellites, as well as several innovative science satellites including DAMPE to search for dark matter, the world's first quantum satellite, and an electromagnetic satellite to study earthquakes, playing an important role in promoting the economic, social and scientific development in China. Since the 1990s, the Long March rockets have been designed to be compatible with satellites manufactured in the United States, Europe and other countries and regions. 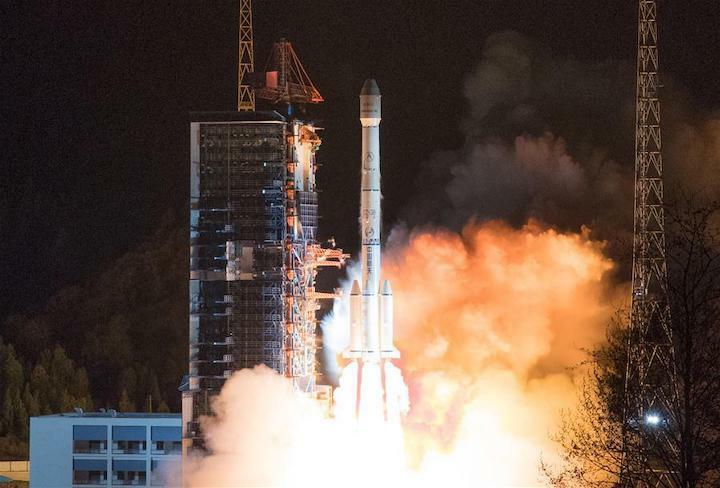 So far, Chinese rockets have launched 56 international commercial satellites and carried more than 20 small satellites or payloads into space for international customers. 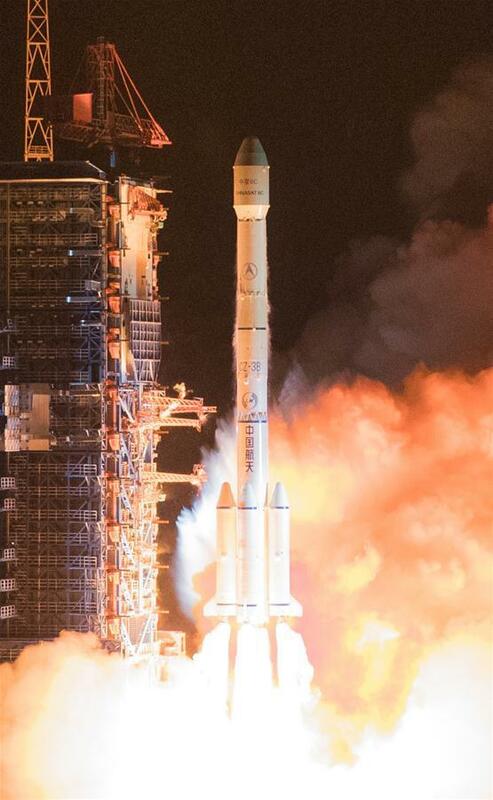 The Long March carrier rockets helped provide launch services for countries participating in the Belt and Road Initiative, including Algeria, Pakistan and Saudi Arabia. The services have been extended from launching satellites to the construction of ground facilities, and management and application of the satellites. From 2015 to 2016, four types of new generation Long March carrier rockets, using non-toxic and non-polluting propellants, were put into use, greatly improving China's capacity of entering outer space. New technologies such as 3D printing and intelligent manufacturing have been introduced in the development of China's new generation carrier rockets. For instance, the Long March-7 is China's first carrier rocket completely designed using digital and virtual reality technology -- no paper blueprint was used throughout the design and production process. The management and production efficiency of the launching vehicles have also been improved. China is now capable of manufacturing more than 40 carrier rockets every year. The new generation rocket Long March-6 does not require a fixed launch pad and can be ready for takeoff within seven days. The preparation time to launch a Long March-11 rocket can be as short as several hours. China's achievements in the space industry have benefited from the enhancement of the comprehensive national strength and the upgrading of its basic industrial capacity. On the other hand, the development of the space industry also helps promote the progress of other industries. For instance, the development of the Long March-5 rocket, which has a diameter of five meters, involved several Chinese industrial enterprises who helped manufacture the propellant tank. China has made many technological breakthroughs in the development of the Long March-5 rocket, which has also promoted the country's industrial manufacturing capacity. Technologies gained from developing the "heart" of rockets are helping China, one of the world's major coal consumers, use coal more cleanly and efficiently. "In China, a large proportion of the grain you eat every day is grown with chemical fertilizers made of materials produced by coal gasification technology transformed from rocket technology," said Zhu Yuying, vice general manager of the Changzheng Engineering Co., Ltd., a company affiliated with the China Academy of Launch Vehicle Technology. The gasifiers produced by the company can increase the utilization rate of coal from 30 percent to more than 90 percent. And one such gasifier can deal with over 3,000 tonnes of coal every day. Currently, China is developing new generation medium launch vehicles including the Long March-6A, Long March-7A and Long March-8. A test version of the Long March-5B, which has the largest carrying capacity to low-Earth orbit, has been produced and will be used to launch the modules of China's space station, according to CASC. China's heavy-lift carrier rocket, the Long March-9, is expected to make its maiden flight around 2030 and will support manned lunar exploration, deep space exploration and construction of a space-based solar power plant. The diameter of the body of the Long March-9 rocket will be nearly 10 meters. And the manufacturing of the rocket will also push forward the development of new materials, technologies, devices and equipment. The new generation launch vehicles will gradually replace the old generation carrier rockets, and space transport vehicles will transition from one-time use to reusable in the future, said Shang. China Sunday sent a new communication satellite into orbit from the Xichang Satellite Launch Center in southwest China's Sichuan Province.